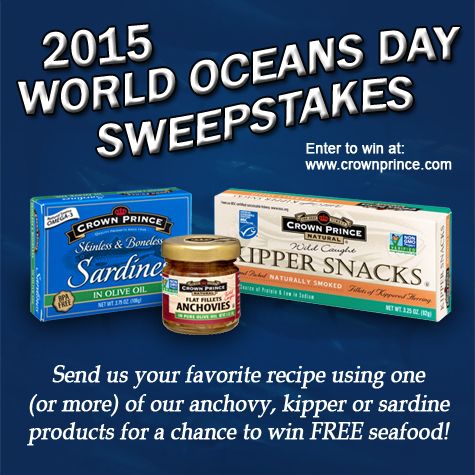 Crown Prince Seafood honors World Oceans Day – June 8, 2015 – with a recipe sweepstakes designed to focus on the most abundant fish species: anchovies, herring (kipper snacks) and sardines. Send us your favorite recipe using one (or more) of our anchovy, kipper or sardine products for a chance to win one free case (12-18 cans) of your choice of any Crown Prince Anchovies, Kipper Snacks or Sardines. There will be 6 winners drawn at random. All entries must be submitted via the sweepstakes form http://crownprince.com/ocean-sweepstakes.htm no later than Monday, June 1, 2015. The winners will be announced on Monday, June 8, 2015 on the Crown Prince website. We will contact all winners directly via phone or e-mail. Submitted recipes become the property of Crown Prince, Inc. and may be used on our website or in a future publication. Visit our website for Official Sweepstakes Rules, Terms & Conditions. Visit http://www.worldoceansday.org/ for more information on World Oceans Day.